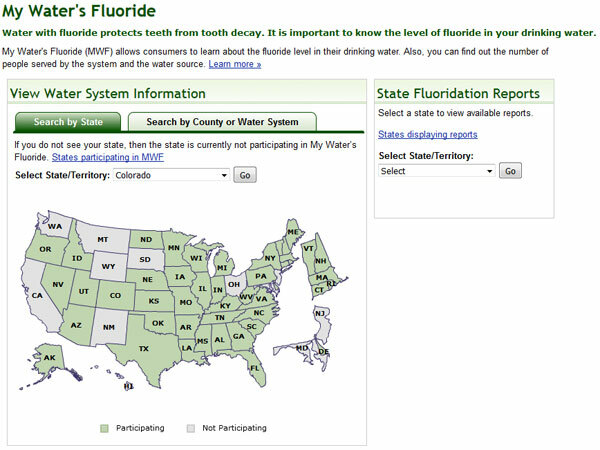 Millions of Coloradans benefit each day from community water fluoridation. That's because 74 percent of our state's communities have fluoridated water. To learn more about your community's water and to see the level of fluoridation in your drinking water, please click below to visit the CDC's easy-to-use tool My Water's Fluoride. On this site, you can search by county or water provider and you can review the CDC's report on Colorado's drinking water. If you do not see your water provider or would like additional information about your community's water, please fill out the contact form on the About Us page. We can help you take action on behalf of your community to help ensure that your water receives the ideal levels of fluoridation to prevent tooth decay.